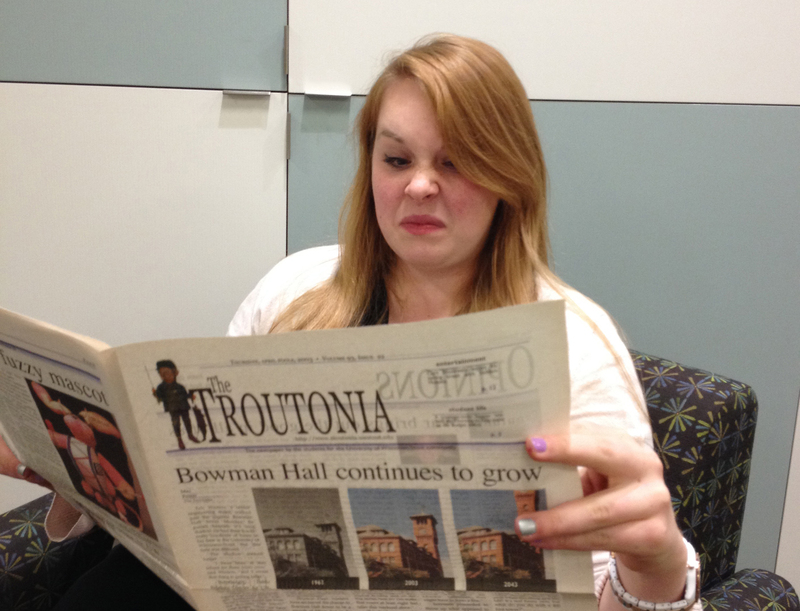 A satirical column in the award-winning student-run newspaper, “Troutonia,” has been shaking things up on the campus of the University of Wisconsin—Trout located in Nemonomie. Since the column’s creation in Sept. of 2014 by aspiring astronaut and local Brad Pitt look-a-like, Derek Korpel, it has become the talk of the town. However, due to the column’s often mesmerizingly well-written nature, some locals have begun to take Korpel’s words a tad too literally. The confusion began with Korpel’s first published piece, “Thousands of Turtles Escape Harry Hall,” an article poking fun at the large number of shell-sporting reptiles wandering the halls of Trout’s most historic building. Many of the university’s more naïve students and faculty were even more dumbfounded by the satirist’s second piece, which humorously points out the unnecessarily high number of Chinese restaurants in town. The article makes the hilariously unrealistic claim that a student actually had a mental breakdown because he could not decide which place to go to get a hot bowl of wonton soup. The town went into such a panic from this piece of fake news that some locals actually started a burrito restaurant just to diversify the area’s dining selections so such a traumatic, and totally made-up, incident would not happen again. The article that Dr. Sport is referring to is perhaps the satirist’s most beautifully crafted piece yet. Entitled “Kwik Trip checkout standoff lasts five days,” the story describes an incident in which two stubborn Kwik Trip customers got to the cash register at the same time. According to the article, it took a full business week for the two to settle on who got to go first. “I was at Kwik Trip every day that week and that definitely did not happen,” said John McNoodle, a student who suffers from a rare disorder that has prevented him from developing a sense of humor his entire life. However, despite all the gullible people at Trout, there are some die-hard Korpel fanatics who understand exactly what he is trying to do. Korpel has yet to come up with an idea for his next satire piece, but sources confirm that he is thinking about doing something regarding the recent misunderstandings of his column.